Proper mulching is the first of line of defense for preserving your landscaping, and choosing the right mulch also benefits our Florida ecosystem. Mulching keeps the soil and plants insulated during colder times, and helps keep the soil moist during the hot summers. The right mulch will also contain soil nutrients that are released as it degrades. Depending on your location in Florida, you probably have access to a wide variety of organic mulches. It is common to find those derived from fallen leaves, wood chips, straw, hardwood and softwood barks. Without getting too deep into the science, you want a mulch that’s rich in nitrogen, which helps promote plant growth. If your mulch isn’t nitrogen-rich, you’ll need to fertilize regularly. Color is a personal preference when picking out mulch. It is common to find red, brown and black mulch. Red mulch works well with plants, trees, and shrubs that are of light color. As a vibrant color, red mulch acts as a good contrast to light plants. It also works well with rock gardens. That is why red mulch is commonly used around office blocks, parks and restaurants. Brown mulch is perfect for light and dark colored plants. It works well in small areas but may lose its beauty after one season, but it’s a still a universal and widely-used color. Black mulch is perfect for commercial areas too – mainly because of its long-lasting color. Black mulch will attract sunlight and heat which means it cannot be used with delicate plants. For a general guide, when selecting mulch color, use your home or building color as a reference. 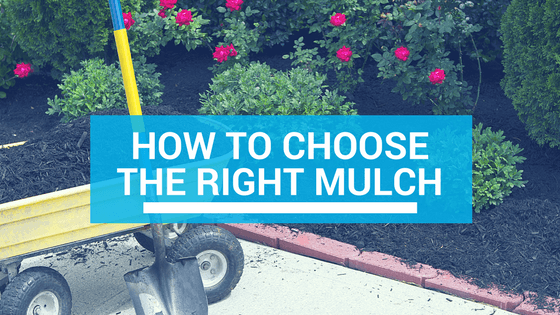 Cost is an important factor to consider when shopping for the right mulch. For starters, there are several components that go into the making of the perfect mulch. You may find softwood and hardwood bark used in the mulch. Others may be gravel, pebbles or rock, or maybe recycled materials. When shopping, it is important to consider the size of your property, how thick the mulch will be, and the lifespan of the mulch. Oftentimes the cheapest mulch will cost more over time, when you have to replace it year after year. Which is the best choice – bag, bulk, or professionally installed? Buying bags of mulch is convenient and easy – you can throw it in your car and spread it easily. But if you’re planning to mulch your entire yard, it can get expensive fast. Bags are best for small flower beds, or replacing small areas. Using a professional landscaper is a good compromise – they purchase the mulch in bulk, know the proper mulch depths, can recommend the right mulch for your yard, and will often be less expensive than the DIY options. The right mulch will make your yard look great, but that’s not its only benefit. Mulch also helps to reduce soil erosion by preventing water from carrying away soil particles. Thanks to its nutrient content (carbon and nitrogen) it promotes the growth of microbes which are beneficial to your plants. And, it helps to inhibit weed germination. If you’re shopping for mulch, consider the color, cost, durability, nutrient content and texture. And, remember that your local landscape pro can provide the right recommendations on all of these.